Meet the Quartos: Ben, Claude, Balth, and Pedro. Their fans worship them. Scotland Yard fears them. And their former drummer will stop at nothing to destroy them. Can these fab four from Liverpool find true love in London and cut an album in seven nights? These Paper Bullets! 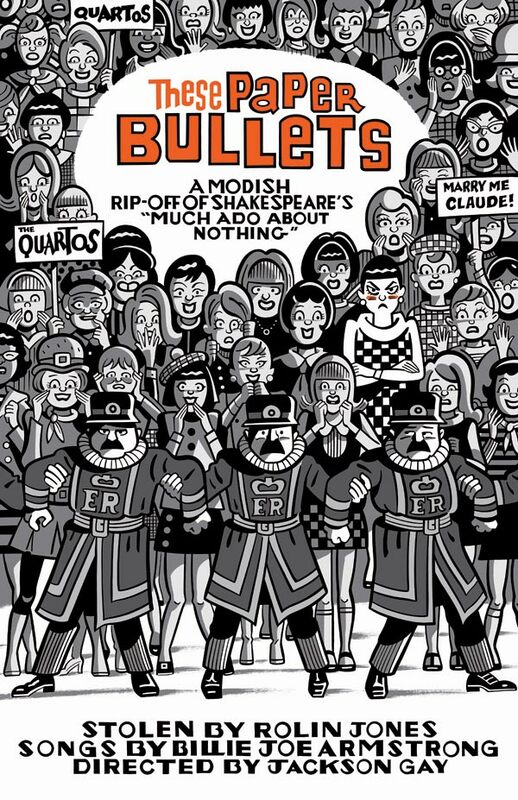 is a modish rip-off of Shakespeare’s Much Ado About Nothing with a serious backbeat. These Paper Bullets! was commissioned by Yale Repertory Theatre, New Haven, CT (James Bundy, Artistic Director/Victoria Nolan, Managing Director). Development and production support provided by Yale’s Binger Center for New Theatre. These Paper Bullets! had its world premiere March-April 2014 at Yale Repertory Theatre. The Geffen Playhouse (Los Angeles, CA), in association with Atlantic Theater Company and New Neighborhood, presented the west coast premiere of the Yale Repertory Theatre production of These Paper Bullets! September-October 2015. Atlantic Theater Company, in association with the Geffen Playhouse and New Neighborhood, presented the New York premiere of the Yale Repertory Theatre production of These Paper Bullets! November 2015-January 2016.